Lyons: apud Seb. Gryphium, 1543. [Rabelais, François (1494? - 1553).] Hippocrates (460 - 370 B.C.E.). Aphorismorum Hippocratis sectiones septem. Ex Franc. Rabelaesi recognitione. 16mo. Collation: [alpha] - [delta]8, a - u8; signatures a - d and leaves e1 - e2 interleaved and bound after signature u in this copy. , 318 pp. Lyon: Apud Seb. Gryphium, 1543. 118 x 72 mm. Calf ca. 1543, rebacked, some edgewear, minor worming, holes for leather ties present on front and rear covers. Very good copy. Extensively annotated in at least two 16th-century hands, in the text, front endpapers and on interleaved pages; 18 leaves of manuscript notes and commentary in what appears to be the same hands bound in the back, followed by 16 blank leaves. Old woodcut armorial bookplate of D'Esbiey tipped to verso of title; later signature "A. de Grateloup" on bookplate. "Collection Victor Jansen" in blue ink on front pastedown. Very rare second edition, first published in 1532, of the Aphorisms of Hippocrates edited by François Rabelais (1494?-1553), the great Renaissance humanist writer and scholar. Rabelais entered monastic life at the age of sixteen, spending about fifteen years at the Franciscan convent of Fontenay-le-Comte before leaving around 1525 to join the more liberal Benedictine order. It was at about this time that he began training as a physician in Paris and Montpellier, obtaining his Bachelor of Medicine degree in 1530 and spending the following year studying Hippocrates' Aphorisms and Galen's Ars parva. 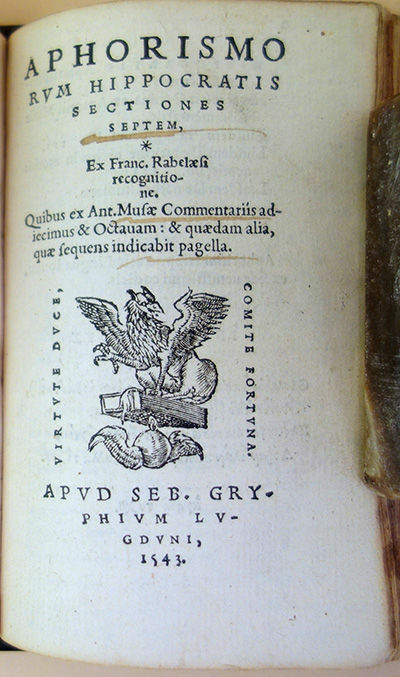 In 1532, after moving to Lyon to serve as physician to the city's Hôtel-Dieu, Rabelais published the work on which his reputation as a serious humanist scholar rests: A small 16mo volume containing Latin translations (by other scholars) of Hippocrates' Aphorisms, Presages, De natura humani and De ratione victus and Galen's Ars medicinalis, augmented with his own annotations. "Rabelais's role [in preparing this edition of the Aphorisms] was that of editor. He had in his possession a Greek manuscript for which he claims the twin virtues of age and unimpeachable clarity. While lecturing at Montpellier he had used this to check the Latin translations current among his pupils and had discovered them to be incomplete and incorrect. He then embodied the result of his observations in a set of notes; and the following year, while he was at Lyons, Stephanus Gryphius saw these notes and suggested their incorporation in a pocket edition of Hippocrates. Rabelais was annoyed by the smallness of the proposed format which meant that his remarks had to be fitted into a very small space, but, pressed by Gryphius, he consented. He took as the basis of his work an edition of the relevant parts of Hippocrates and Galen which Colines had published in 1524. It was decided to reprint this and then to add Rabelais's notes in the form of interpolation and marginal comment; and Rabelais's Greek text of the Aphorisms according to his much vaunted manuscript was printed as an appendix" (Bolgar, p. 63). Our copy of the second Rabelais edition begins with the Greek text of the Aphorisms, which has its own title-page; in most copies, these signatures are bound at the end of the work. It is likely that the interleaving and eccentric arrangement of the remaining signatures was done at the request of the 16th-century owner whose copious annotations, written in a tiny, beautiful and legible italic hand, fill most of the interleaved sheets as well as the margins of many text pages. Some notes in a different hand are also found on several leaves. Adams H-576, H-558. Bakhtin, Rabelais and his World, p. 361. Bolgar, "Rabelais's edition of the Aphorisms," Modern Language Review 350 (1940): 62-66.